...and television news coverage eventually led state officials to examine the farm, known as "Maplewood," and confirm its identity as Margaret's home from her birth in 1833 to her unsuccessful escape in 1856. 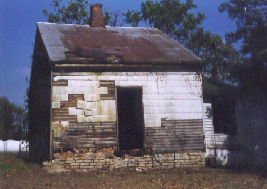 Still existing on the property are two 19th century structures - a smokehouse and a cookhouse, where Margaret may have worked as a domestic slave. By November 1998, emergency funding ($12,000) from Kentucky State University (Anne Butler, PhD: Center of Excellence for the Study of KY African Americans) brought a team of archeologists (SEE PHOTOS) from the Kentucky Archeological Survey to the site. 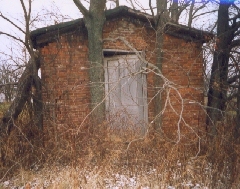 Preliminary field research was carried out for two weeks on the Richwood, KY property with the help of many individuals and institutions (University of Kentucky Department of Anthropology, Kentucky Heritage Council, Kentucky African American Heritage Commission, Boone County Office of Historic Preservation, Jeannine Krinebrink, college students from Kentucky State University and Georgetown College, volunteers from as far away as California). 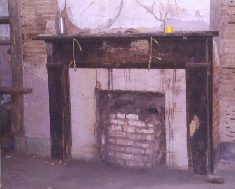 The archeologists uncovered the remains of a main house, which burned in 1850. They also found a stone foundation or hearth from an earlier house or detached kitchen, and mid-19th century domestic trash deposits (cut nails, an 1842 penny, porcelain and other ceramics, wine bottle, whiskey flask (SEE PHOTOS). Was this Margaret Garner's house and trash Most artifacts were found in the area most likely to be the former slave quarters, but only more excavation and analysis will be able to answer that question. Chief archeologist, Dr. Kim McBride, estimates an additional $25-30,000 is needed for a complete (4-week) dig of the slave and main house areas. The current land owner, a Cincinatti businessman, has agreed to fully cooperate with the archeological studies by permitting further excavation. Funding, however, must come from outside sources. Oprah Winfrey was contacted by Caputo in early 1999 to help fund the scientific research, but her spokesman, Rufus Williams, said by telephone "she wishes to decline contributing at this time" - even in a matching grant - since she's put a "large effort behind the Beloved project and that is enough right now." Caputo contacted Ed Rigaud, President and CEO of the National Underground Railroad Freedom Center, (not yet fully funded or constructed in Cincinatti) who regretfully stated that the Freedom Center "has stringent policies about the areas we support (primarily education and no preservation)." They recognize, however, "the importance of the Margaret Garner story" and plan to invest in its "educational aspects." Rigaud offered to notify Caputo if he finds funding possibilities elsewhere, but bottom line - no funding available from the Freedom Center at this time. Caputo also attempted to contact actor/director Tim Reid of Reid Productions, Inc., but received no response. Private and corporate donations will allow the Margaret Garner Excavation and Collections Research to continue. Tax-deductible donations are welcome in any amount. A receipt will be mailed back to you. Make check payable to: "University of KY - Margaret Garner Excavation"